HYPERTROPHY: the enlargement of an organ or tissue from the increase in the size of its cells. Yes it’s possible, but you have to change the way most people work with them, you have to follow the same program as bodybuilders do, heavy and slow reps paired with a strict diet. The staple of bodybuilding exercises are front squats, shoulder presses, chest presses, rows, carries, isometrics, and curls. Nothing different between time under tension or time under tension, weight equals weight, you just need to know how to use it, those that say otherwise just don’t know. “But look at Ivan Denisov no one lifts heavier kettlebell weights than he does and he doesn’t look big.” He’s as strong as an ox and what he lifts most bodybuilders probably can’t even lift, but Ivan trains for Kettlebell Sport, not hypertrophy. Ivan trains for high reps and endurance, one does not get YUUUUGE from that. If you want hypertrophy, you have to train for hypertrophy, and if you want to run 100 miles you have to train to run 100 miles. Nothing beats the barbell. This is true, but within context and not for all exercises. If you need to deadlift, front-squat, row or press more than 96kg go to the barbell. But… let us not forget about the unilateral quality of the kettlebell and its design, two 48kg kettlebells weigh the same as a 96kg barbell but the kettlebell adds a complexity which requires more muscle recruitment. The angles you can chest press in with kettlebells is far more superior than the barbell. “So if you wanted to get swole from kettlebells what would you do? And why don’t you look swole yourself, how can you tell me how to get swole when you’re not swole or yoked up?” Simple answer, I train for GPP, movement, strength, endurance, agility, cardio combined, I don’t focus on one thing. But here is how I train my clients when they want to get big. First, I make sure they’re truly committed and understand that most bodybuilders use something else than a barbell, something most don’t talk about, but let’s not go there right now. Second, they follow a strict program and diet. If you can’t do that, don’t expect to be looking like the Hulk anytime soon. Just because kettlebells are mostly used for anything but hypertrophy—because most of us kettlebell enthusiasts care more about other things than looking huge and impressive—doesn’t mean that they can’t be used to achieve hypertrophy to the extent of what bodybuilders do. 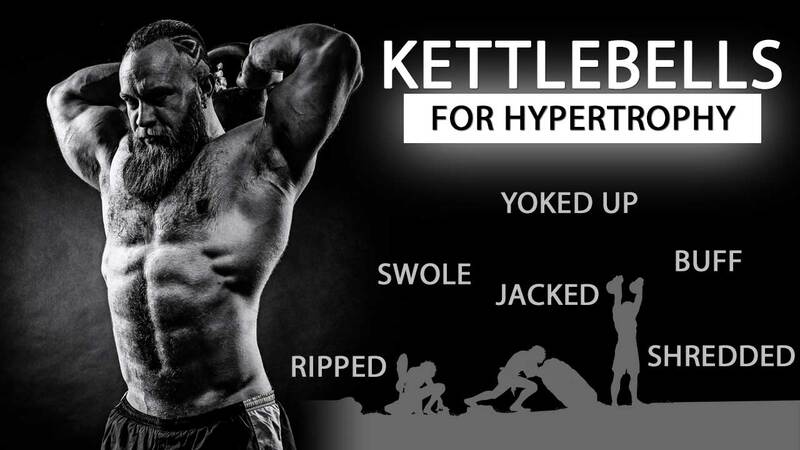 So… Is kettlebell training a waste of time for hypertrophy? Nope, that’s not the case, hypertrophy will occur if you’re lifting weight, it’s just that when people talk about hypertrophy training they refer to the type of training that is intended to induce the fastest muscle growth. Rows are usually done with dumbbells to provide the unilateral quality required to provide more isolation than the barbell can’t provide. Thus the kb is just as great. Deadlifts, no doubt that you can go higher in weight with the barbell, consider this though, stacked grip with two 48kgs (96kg) in one hand! The grip strength required is also double, grip strength defines a lot of your training, no grip strength, no heavyweights. Two birds one stone type of thing. On the topic of grip, the next in line are the wrists, weak wrists mean injury and inability to lift heavy, the kettlebell is great to work on the wrist due to the different weight distribution compared to the dumbbell, I’m thinking overhead tricep extensions, pull-overs etc. Curls, I’ve previously written enough on, but again so many angles possible. In the end, use what works best for you, use what you prefer to use, but don’t say you can’t do hypertrophy training with kettlebells. Side note: I’m not saying that kettlebells are all you need, just like a bodybuilder doesn’t just use the barbell, so include pull-ups and other exercises. The kettlebell also has increments of 1kg or less with KETTLE WEIGHTs.